The FPS Freek Legendary was created for the Halo player who needs to dominate the competition every round and look good doing it. Developed with greater control and accuracy in mind, the FPS Freek Legendary is the FPS Freek with a sick, new twist. For the first time ever, FPS Freek Legendary lets Xbox 360 gamers play Halo using the superior control of a laser-etched, convex thumb pad. This allows you to keep those sweaty thumbs on the sticks at all times and show your opponents how good you really are. Play with it for a few rounds and you’ll understand why this FPS Freek is worthy of the Legendary name! The extended sticks let you make smaller adjustments and “snap” to, track and hit targets faster and more accurately. This added precision enables you to get the most out of powerful armaments like the Spartan Laser! The increased leverage affords you the luxury of turning up controller sensitivities for faster movement with less effort. So, if you are getting shot from a direction other than where you’re looking, you can react and defend yourself more quickly. 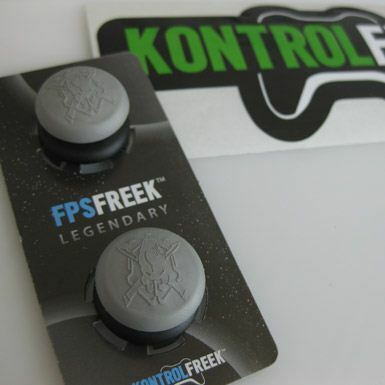 Outlast the competition, climb the leaderboards and be the envy of your clan with FPS Freek Legendary. FPS Freek Legendary is a MUST for snipers—or users of any scoped weapon, like the new Designated Marksman Rifle! It comes in packs of two, so pick up a pair and dominate!